Inside each spindle-shaped bag is the larva of the leaf- and ~needle-eating bagworm ( ).. Sometimes I need to heed my own advice and spend more time scouting my garden and landscape for problems. As we all know, small problems tend to be easier to solve than big ones. This past weekend, I ran into a big problem with my Atlantic white cedar (Chamaecyparis thyoides), which was adorned with a variety of nearly identical “Christmas ornaments”. Unfortunately, I quickly realized that Christmas was more than 5 months away, and that these nature-based “ornaments” hanging from the scantily clad limbs were the handiwork of bagworms (Thyridopteryx ephemeraeformis). Bagworms, the larval or caterpillar stage of a moth that is rarely seen, defoliate many other conifers, including juniper, arborvitae, cypress, spruce, and hemlock. They also will consume the leaves of many other trees. In fact, these voracious buggers attack more than 120 species of woody ornamentals, including deciduous shrubs and trees such as black locust, buckeye, elm, honeylocust, maple, sycamore, and willow. 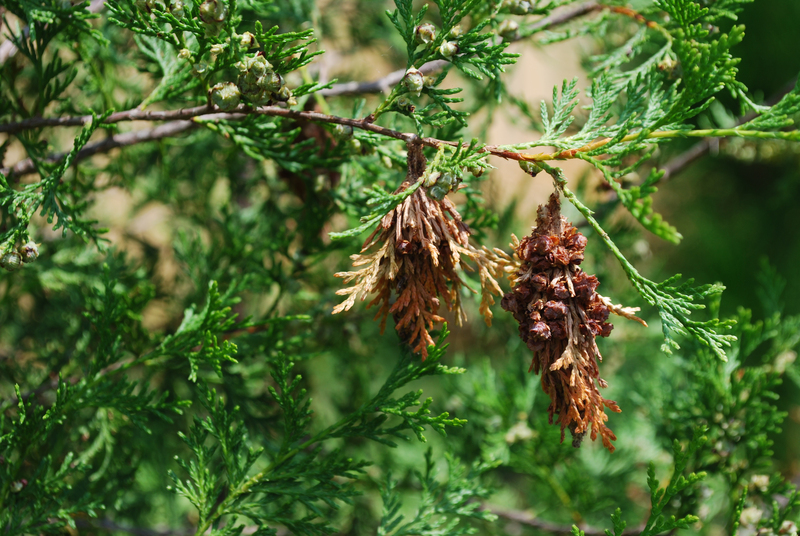 Heavy bagworm infestations can lead to branch dieback. Sometimes trees can be killed outright, especially after having been completely defoliated over one or two seasons. These gourmands of the insect world intrigue me, mostly because of the spindle-shaped bags constructed by the young caterpillars or larvae as they feed. Each larva builds a bag of silk and bits of leaves and twigs from the host plant so its appearance varies from plant to plant. Unbeknownst to me, the bagworms larvae were feasting and toting their bags for 8 to 10 weeks; they gradually enlarge their bags with every molt. When the larvae reach full size, they stop feeding and secure their one- to two-inch long bags to a twig to pupate. About a month later in September and early October, the brown furry male moths with clear wings will emerge, fly to the wingless females, and mate with them inside her bag. Although the female bagworm is a moth, she doesn’t look like one. She has no wings, eyes, legs, antennae, or functional mouthparts. In fact, her soft yellowish-white body never leaves the bag. After mating, she lays 500 to 1,000 eggs inside her bag before dying, encasing her clutch with her mummified body. There is only one generation a year. The best course-of-action right now is to remove the bags by hand to interrupt mating and to reduce next year’s population. These bags may be difficult to remove without damaging the twig, so pruning shears may be necessary to cut the threads. From my single 5 ½-foot tall Atlantic cedar, I picked and discarded 132 bags. Sadly, my wife or daughter expressed no interest in this task; they didn’t believe me when I told them that it was like removing ornaments from a Christmas tree. OK, I’ve learned my lesson. Next year I’ll be on the lookout for small bagworm caterpillars emerging in late May or June. Egg hatching begins when the black locust flowers begin to fade and is complete when the Japanese tree lilacs are in full bloom. When the young larvae start feeding and building their bags, I will consider applying the bacterial insecticide, Bacillus thuringiensis var. kurstaki (Dipel® or Thuricide®) or spinosad (Ferti-Lome® Borer, Bagworm, Leafminer & Tent Caterpillar Spray or Spinosad). See “Less Toxic Insecticides” for additional controls. This weekend I felt that I was alone in my battle against bagworms, but I’m not. Working in concert with my efforts are birds and several ichneumonid and chalcid wasps that parasitize the larvae. Also, low winter temperatures can damage the overwintering eggs. I just hope that next year the birds, parasites, and parasitoids that relish bagworms pick up their game so I won’t have to. June 28, 2014. SC Botanic Garden, Clemson, SC. June 28, 2014, SC Botanic Garden, Clemson, SC. 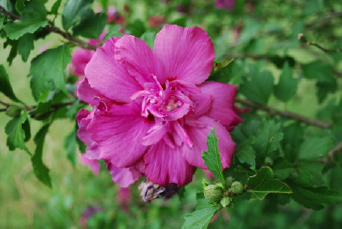 Rose-of-Sharon blooms in the torrid months of June to early September. Depending on the cultivar, flowers can be single or double in a range of colors that include white, pink, purple, blue and red. The flowers give rise to highly fertile seed pods, which can become a nuisance. 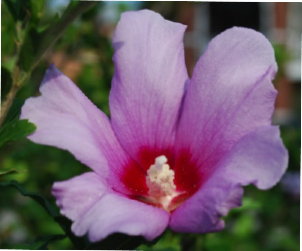 I still remember a roadside rose-of-Sharon that I rescued more than a decade ago. 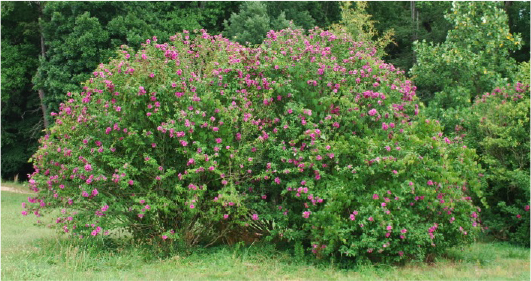 I never realized that this single shrub would thank me with bazillions of offspring. Fortunately, there are new, sterile to semi-sterile cultivars that have been selected for their compact nature (older cultivars are prone to legginess) and gorgeous flowers. June 14, 2013. Tybee Island, Ga. Despite the availability of new releases, I’m old-fashioned and like to go retro with these 1970s releases from the U. S. National Arboretum: ‘Diana’ (white), ‘Aphrodite’ (pink), ‘Helene’ (white), and ‘Minerva’ (lavender). These sterile cultivars named after Greek goddesses have compact growth habits, leathery dark green leaves, and produce little or no seeds. Site them and any rose-of-Sharon in full sun. Since they produce flowers on current season’s branches, prune these deciduous shrubs when they’re dormant in late winter, preferably with bypass pruners or loppers–not your granddaddy’s pickup. “Recently discovered” lIve oak (Quercus virginiana) in Iron City, GA.
6835 James B. Rivers/Memorial Dr., Stone Mountain, GA 30083. The current champion is a live oak (Quercus virginiana) in St. Tammany Parish, Louisiana. According to the American Forests Champion Trees site, this “big tree” made the list in 1976 and “is the largest known tree of its species in the country.” This 68 ft. tall live oak has a crown spread of 139 ft. and a trunk circumference of 467 inches. Do we have a new champion? In South Carolina, our biggest live oak is 62 ft. high with a crown spread of 129 ft. wide and a trunk circumference of 385 inches. Sadly, its canopy was damaged in a storm. Over the years I’ve promoted the use of organic mulches (see tomorrow’s entry). Occasionally, unexpected “issues” arise, such as the phallus-shaped dog stinkhorn fungus (Mutinus canines) or the neon yellow, foamy-looking slime mold that looks like a colorized version of the blob. These invaders may be unsightly, but they are harmless. The neon yellow slimes molds are called scrambled-egg slime or the “dog vomit fungus.” They appear from spring through fall, usually when moisture is available. Slime molds spread by spores, which could have already been present on the mulch or were blown in by the wind. When the spores come into contact with water, they burst and release amoeba-like cells. These cells eventually unite with other cells to produce a plasmodium, that scary, frothy-looking mass. It flows over mulch, sidewalks, and driveways in search of fungi, bacteria, and decaying organic matter. Scientists have discovered that the plasmodium moves as much as 2 feet or more per day in response to light and food. Eventually, the slime mold reaches the reproductive phase when it dries and develops mushroom-like fruiting bodies that release the dustlike spores. Because this curiosity eventually dries up and disappears, no control is necessary. However, if its appearance bothers you, break it apart with a garden rake with water from the hose. Slime mold invasions can be avoided by adjusting the irrigation system to prevent the mulch from becoming too wet. Also, periodically fluffing up the mulch with a rake will help aerate it and speed up drying.